Labor Day is meant to be a celebration of work. Yet, on this Labor Day, few have reason to rejoice. The Bayt.com Job Satisfaction in the Middle East and North Africa survey, April 2015, which polled over 5,774 employed men and women over the age of 18, shows that professionals in the MENA region now feel worse about their jobs —and work environments— than ever before. People of all ages, and across income levels, are unhappy with their supervisors, apathetic about their organizations, and detached from what they do. In fact, the survey revealed that only four out of 10 respondents are satisfied with their current job. 18% of them being ‘very’ satisfied. Many business owners might think that employees need more money to be happy. With 45% MENA professionals dissatisfied with their current pay, according to the Bayt.com Salary Survey 2014, that would make sense— although perhaps not necessary. What business owners need to do is to listen to the demands of a workforce burdened with debts and an ever-increasing cost of living. Employers should keep their promises and show compassion for their employees. If you promised your employees a pay raise this year, give it to them. If you promised resources to help them be more efficient at their job, give it to them. 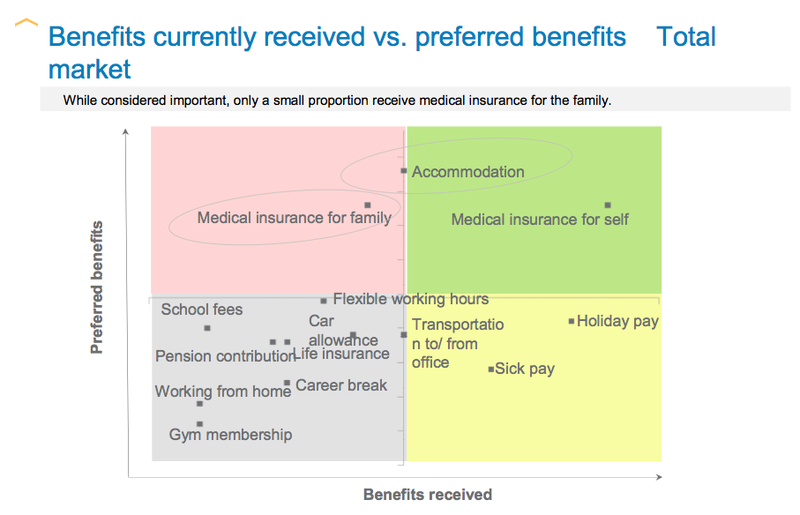 If you promised more flexibility or a better work-life balance, give it to them. Find what’s important to your employees and give it to them. When employees feel that the company takes their interest to heart, then the employees will take company interests to heart. It’s not too late, but business owners need to heed the warning, especially when 61% of employees are willing (and actively trying) to change jobs, and over half of them (51%) strongly believe that they could easily find a similar job in another organization, as per the Bayt.com Job Satisfaction in the Middle East and North Africa survey. Over the past few months, we researched the micro-level causes behind this macro-level problem. To gain real-time perspective into everyday work lives, we used the Bayt.com Job Satisfaction in the Middle East and North Africa survey to collect data from professionals across the MENA region. Our survey asked respondents to describe the factors that affect their satisfaction and overall happiness at work. Our analysis revealed their inner work lives— the usually hidden perceptions, emotions and motivations that people experience as they react to and make sense of events in their workdays. The results were alarming. In one-fourth of the answers gathered, the employee was unhappy, unmotivated, or both. In fact, employees often expressed frustration, disdain or utter dissatisfaction. Our research shows that inner work life has a profound impact on workers’ creativity, productivity, commitment and collegiality. Employees are far more likely to enjoy the work they do when they feel happier. 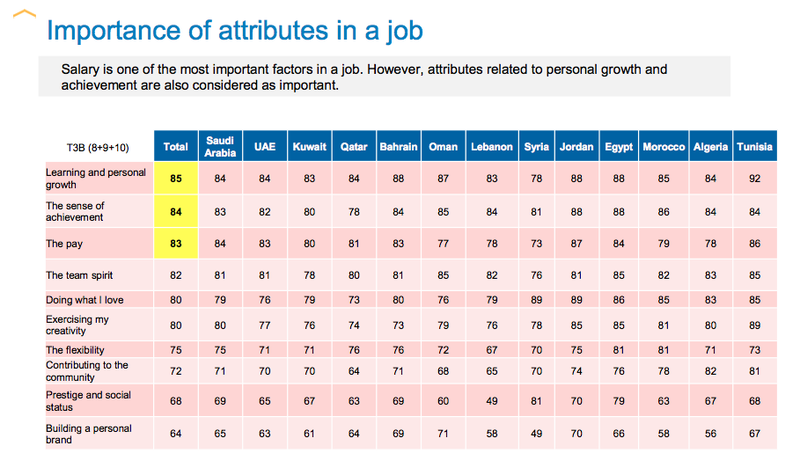 Contrary to popular belief, the most important factor related to job satisfaction in the MENA is not money; it is learning and personal growth, according to 85% of respondents. This is followed by ‘a sense of achievement’ (84%), and ‘pay’ (83%). Other important factors are ‘team spirit’ (82%), ‘doing what I love’ (80%), and ‘exercising my creativity’ (80%). Over 70% of respondents also believe that ‘contributing to the community’ is a matter of importance– a belief which is stronger in North Africa (77%), and especially in Algeria (82%) and Tunisia (81%). Overall, less than a half (40%) are satisfied with their present job, with only 18% of them being ‘very’ satisfied. Respondents in Egypt seem more satisfied with their current job than their counterparts elsewhere in the MENA; close to one fourth (24%) claim that they are very satisfied. Only a third (32%) see themselves working for the same company for the next two years, while 61% are actively trying to move to another organization. About one out of every two respondents strongly believe that they could easily find a similar job in another organization. Low base salary (66%) followed by lack of career growth opportunities (62%) are the main reasons for leaving an organization. Unfortunately, only 27% believe that their company shows an interest in the wellbeing of its employees, with 48% claim that they have a good work-life balance, while 52% believe the opposite. A higher proportion of respondents from the UAE (32%) are less happy with their working hours. What happens when people express low job satisfaction? 1. Job stress When employees are not happy with their jobs, they are much more likely to experience (and report) stress on the job. Workers who are satisfied or happy at work are much less likely to report feeling stressed out by their job. This is basic human nature. If you are not doing something you enjoy, you will eventually feel dissatisfied and then smallest things will make you feel stressed out and unhappy. 2. Poor employee morale When one employee is miserable doing their job, all of the other employees they come into contact with are going to be affected by them. If they see someone who is so obviously sad and dissatisfied, it will begin to color how they view their own jobs. Negative attitudes can spread through a workplace like wildfire and, if they are not improved, the overall morale of the employees will take a sharp decline. 3. Lack of productivity Low job satisfaction, coupled with low employee morale results in a lack of productivity. When someone is unhappy, they lose their concentration and find hundreds of other things to do that do make them happy, all the while ignoring the job they should be doing. When one member of a team displays low productivity, it is only natural for other members of the team to feel dissatisfied as a result, and their productivity will begin to decline as well. It is a vicious cycle that is all too common. 4. High employee turnover rates Low job satisfaction creates high turnover rates with employees. Sooner or later, the employee is going to quit when they find a job they actually enjoy doing. Many industries suffer from high turnover rates and the inability to retain qualified workers. It is up to small business owners and managers to find a way to increase job satisfaction. Professionals in the Bayt.com Employee Motivation in the MENA Workplace survey were quite clear about their priorities: they want a better work-life balance. Whether it is to spend more time with family and friends or on sports and learning pursuits, a good work-life balance is repeatedly identified as the top motivating factor at work in the MENA. In 2015, achieving a good work-life balance will possibly be as simple as altering working arrangements to enable more flexibility. Possible new arrangements mentioned in the Bayt.com Work-life Balance in the MENA poll include a work-from-home arrangement (10.4%), a flextime arrangement with the same hours (22.7%), a flextime arrangement with fewer hours (7.3%), or a part-time work arrangement (0.7%). A transparent work environment not only ensures that your employees stay motivated and put in their best in what they do, but it also attracts the best talent to your organization. People want to work in an organization where they feel their opinion is valued, where their managers and peers are honest with them and where they find consistency and stability. An easy way to keep the troops upbeat and motivated is to adopt an ‘open-door’ policy in which communication with others is facilitated and encouraged. The more employees feel they can approach other members of the organization, the less alienated they feel and the more likely they are to actively involve themselves in their job. 35.6% of respondents in the Bayt.com Skills and Hiring Trends in the MENA poll think that there is a skills gap in some areas in their company. For 29%, a solution to building necessary expertise is simply by increasing training investments. Fortunately, 73.1% of them believe that their company’s project investment in training will increase in 2015. Other suggestions to bridge the skills gap include redeploying employees to roles where their skills are most needed (22.1%). In 2015, companies across the MENA are expected to help professionals in acquiring new skills via a combination of on-the-job experience (13.5%), formal internal training (21.9%), formal external training (16.5%), and by shadowing and observing others (9%). 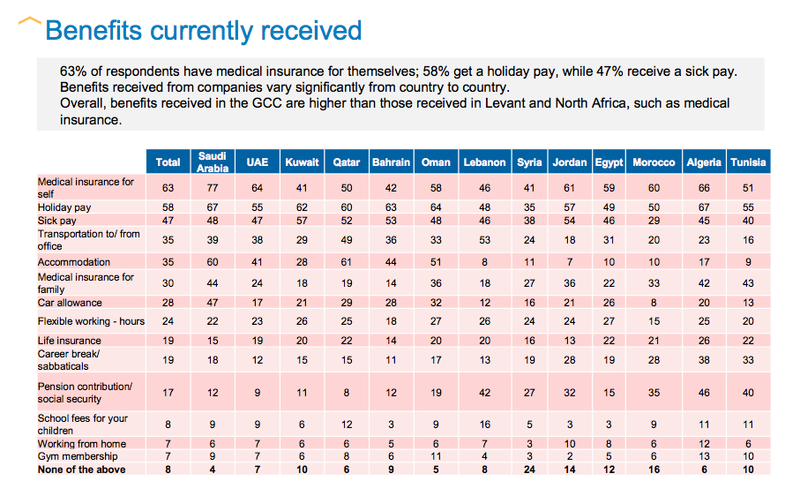 61% of respondents in the 2014 Bayt.com MENA Salary Survey believe that salaries in the MENA are on the rise. This is considered to be due to inflation and the rising cost of living, as well as the economic growth some of these countries are witnessing, and pay rises in the public sector. Undoubtedly, employees feel short-changed, and with an increase in the cost of living and a presumption other employers pay more, we may see significant churn over the next year as employers struggle to match employees expectations and ensure parity and fairness in pay structures. Tools such as Bayt.com Salaries have ensured that salary figures for different roles and industries in the region are widely available and can be shared and discussed openly. The importance of giving regular and constructive feedback to encourage, motivate and guide cannot be overemphasized. Companies should adopt a comprehensive firm-wide performance appraisal system for formal appraisals, and complement that with regular informal face-to-face meetings to discuss progress. Regular positive feedback for key accomplishments and contributions is a key criterion for raising both employee morale and overall happiness in the workplace. The Bayt.com Job Satisfaction in the Middle East and North Africa survey has shown that trust levels towards both senior management and line managers are low. Your role as a manager or business owner is to help ensure that people are happily engaged at work. Doing so isn’t expensive. Employees’ well-being depends, in large part, on a manager’s ability and willingness to facilitate employee accomplishments. Removing obstacles, providing help, and acknowledging strong effort are great ways to achieve that. The single most important thing to do is simply facilitating progress in meaningful work. As long as workers experience their job as meaningful, progress is often followed by joy and excitement about the work. The times of simply punching a clock to put food on the table may be on their way out as employee expectations transform. While the concept of accountability and being present is still an important part of having a job or career, employees are looking for far more in a job than just provision. In turn, it is essential that companies learn and know how to treat employees and realize that a happier workforce will equal a more productive and motivated company as a whole. Employee happiness and satisfaction must remain, or become, paramount concerns for any company looking to succeed. Promoting employees’ well-being isn’t just ethical; it makes economic sense. Fostering positive inner lives requires leaders to better articulate meaning in the work for everyone across the organization. Sometimes, all that’s required is that managers address daily hassles and help with fulfilment dilemmas. If those who lead organizations -from CEOs to small-team leaders- believe their mission is, in part, to support employees’ everyday progress, they could end (or at least curtail) the dissatisfaction crisis across the MENA region.